It’s No Mystery–Stray Dog’s “Drood” Is a Hit! An unfinished novel by one of literature’s most celebrated writers might seem like a strange subject for a musical, especially one written by a guy who’s probably best known for a 1970s one-hit-wonder pop song. 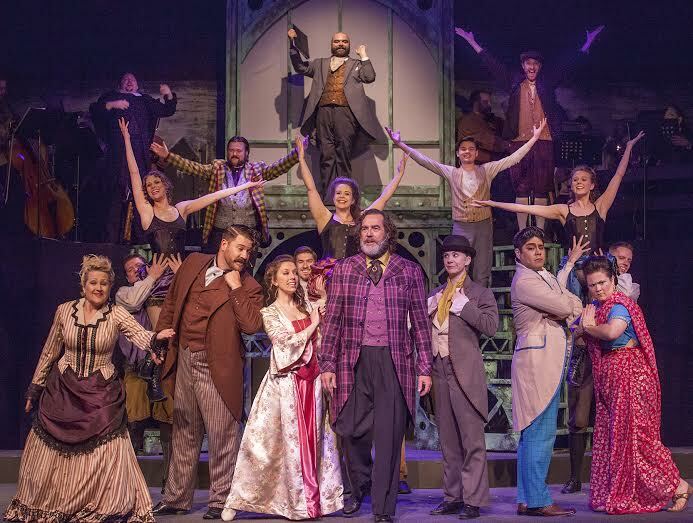 Still, The Mystery of Edwin Drood is a remarkably memorable, energetic and tuneful show, popular in the 1980s when it debuted on Broadway, and in its more recent revival. It’s a great show for a company like Stray Dog and director Justin Been, who brought a vibrant and striking edition of Cabaret to St. Louis audiences last year. And Drood does not disappoint. Boasting top-notch technical elements and an extremely strong cast, this musical’s appeal is definitely no mystery. Written by singer-songwriter Rupert Holmes, who famously recorded “Escape (The Pina Colada Song)” in 1979, Drood acknowledges the unfinished nature of Dickens’ story with a clever conceit. The show is staged as a play-within-a-play, as a troupe of English music hall performers are putting on a production of the story and the group’s Chairman (Gerry Love) explains the novel’s background. The idea is that they will be performing the story as written up until Dickens stopped writing, whereupon it will be left to the audience to vote on how it concludes. The Dickens tale is told, with occasional “breaking of the fourth wall” by the music hall performers who are playing the novel’s characters. The essential story is one of mystery, intrigue and jealousy, as oily choirmaster John Jasper (Zachary Stefaniak) yearns for the innocent young Rosa Bud (Eileen Engel), who is long betrothed to Jasper’s nephew, the eponymous Edwin Drood (Heather Matthews, playing a woman playing a man). Along the way we meet other characters, such as the Reverend Crisparkle (Patrick Kelly), who has a past connection to Rosa’s mother and who is housing twins Helena (Kimberly Still) and Neville Landless (Kelvin Urday), who have recently emigrated to England from Ceylon. Neville quickly becomes involved in a rivalry of sorts with Drood. Meanwhile, the unstable Jasper seeks comfort in an opium den operated by the mysterious Princess Puffer (Lavonne Byers). The somewhat convoluted story, which leads to the disappearance and presumed murder of the title character, also involves the town’s mayor (played in a last minute substitution by the Chairman himself) and bumbling drunkard Durdles (Eric Woelbling) and his young sidekick Deputy (Kevin Connelly). After many twists and turns of the plot, the story finally ends in a fashion chosen by the audience, with a different murderer, detective and pair of secret lovers chosen every night by vote. This is a big show, especially for the small-ish Stray Dog stage, and the well-chosen cast fills that stage extremely well, with excellent voices, well-executed choreography (by Stefaniak) and seemingly boundless energy. Love is a charming, hilariously entertaining Chairman, both introducing the proceedings and eventually reluctantly participating in them. There are strong turns by all of the cast members, as well, with Stefianiak reveling in the oily over-the-top manic energy of Jasper, although his enunciation on songs such as “A Man Could Go Quite Mad” is occasionally uneven. As male impersonator Alice Nutting playing Edwin Drood, Matthews displays excellent stage presence and impressive vocals. Her duet on “Perfect Strangers” with Engel as Rosa is a highlight, as her return in the show’s epilogue of sorts, “The Writing on The Wall”. Engel is a real find, playing the gutsy young Rosa with spirit and displaying a strong soprano voice on songs like “Moonlight” and its reprise. There are also memorable performances from Michael A. Well’s as the scene-grabbing Bazzard, Urday as the hot-headed Neville, Still as the feisty Helena, Woelbling as the comical Durdles and Connelly as the clueless but eager to please young Deputy. Byers is, as usual, in excellent form as the scene-stealing Princess Puffer, deftly delivering broad comedy on “The Wages of Sin” as well as poignant emotion on “The Garden Path to Hell”. The ensemble doesn’t have a weak link, either, with excellent vocals and tons of energy on group numbers like “There You Are”, “Off To the Races” and “Don’t Quit While You’re Ahead”. Visually, this show is a treat as well. The set, designed by Rob Lippert, is colorful, evocative, and versatile, with a set of green-painted staircases that can be rearranged in various configurations to suit the scenes. The costumes, by Engel, are also richly detailed and period appropriate, with a rich array of colors and patterns. Tyler Duenow’s lighting sets the mood well, from the vibrant opening to the more mysterious elements later on. There’s also a first-rate band led by music director Chris Petersen, which expertly conveys the melodic energy of Holme’s catchy score. I had never seen a production of The Mystery of Edwin Drood before, although I was familiar with the basic idea and some of the music. Stray Dog’s production is an ideal introduction to this tuneful, energetic and often hilarious musical, with an extremely impressive cast and impressive look and sound, and the fun bonus of a potentially different ending every night. It’s every bit as good as last year’s Cabaret, and maybe even a little better.